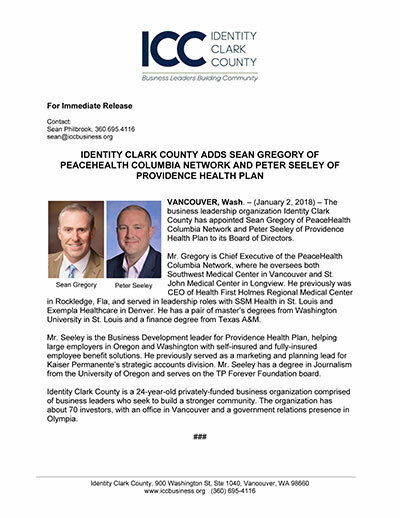 Mr. Gregory is Chief Executive of the PeaceHealth Columbia Network, where he oversees both Southwest Medical Center in Vancouver and St. John Medical Center in Longview. He previously was CEO of Health First Holmes Regional Medical Center in Rockledge, Fla, and served in leadership roles with SSM Health in St. Louis and Exempla Healthcare in Denver. He has a pair of master’s degrees from Washington University in St. Louis and a finance degree from Texas A&M. Mr. Seeley is the Business Development leader for Providence Health Plan, helping large employers in Oregon and Washington with self-insured and fully-insured employee benefit solutions. He previously served as a marketing and planning lead for Kaiser Permanente’s strategic accounts division. Mr. Seeley has a degree in Journalism from the University of Oregon and serves on the TP Forever Foundation board.